I’d hoped that Christmas would have marked the start of the winter and provide me with the start of winter log book days for this season, ahead of me preparing for my Winter Mountain Leader Assessment in a few months. Whilst there had been snow in December, by the time we arrived in Fort William we were in the middle of a thaw and the North Face of Ben Nevis was devoid of snow – except on the very upper reaches of the gullies. Despite this we set off at 7.45am in the dark to do the Carn Mor Dearg arête and Ben Nevis, a challenge even in December’s ‘summer’ conditions. The walk through the woodland from the North Face car park is straightforward even in the dark and takes about an hour to get to the fence which marks the open moorland and access to the North Face of Ben Nevis. It was a typical Scottish morning and the dark was accompanied by wind and rain. We soon found the barely noticeable footpath off the main track which heads up onto Carn Beag Dearg and beyond to the wide open ridge to the munro summit of Carn Mor Dearg. It was noticeable how mild the conditions were as we immediately started wading through moorland bog as we trudged uphill. Despite heading into the mist around 600m the route isn’t complicated as it heads south-east along the top. A cairn marks the first summit of Carn Dearg Meadhonach before reaching the summit of Carn Mor Dearg. We had been here in March in the midst of the fantastic winter but were beaten back by strong winds; it was such a contrast to be here in mild damp conditions. Beyond the summit, the CMD arête begins to head south before curving round the head of the valley south westwards, towards the col before Ben Nevis. At around 1.5km long it is certainly a committing ridge as you cannot escape once on it, without retreating. Despite being a grade 1 scramble in summer conditions, it is not as complicated as Crib Goch or the Devil’s Ridge on the Ring of Steall, as there are no technical scramble sections which cannot be completely avoided. That said in winter conditions it would be a committing and slow undertaking. From the col the route scrambles up between the rocks to reach the summit of Ben Nevis. Whilst the summit did still have snow, it wasn’t so significant that we had to use crampons or axes. The mist wasn’t even so low that we couldn’t see the large summit cairns marking the way. That said its important to be prepared up here, as the summit plateau is treacherous in poor visibility. Gardyloo Gully is very close to the trig point, and requires navigation around to get back to the tourist path back to Glen Nevis. Its useful to have the key information scribbled on the edge of your map to aid descent – a bearing of 231 degrees walked for 150m, then stay on 282 degrees to reach the zigzag path and the large cairns. Beware that if you stray too far on the first bearing its possible to mistakenly enter the top of Five Finger Gully. Be confident in your pacing in poor visibility. If you want a detailed article on navigating on the summit check out UKHillwalking. Despite it being December as we descended we met the ubiquitous idiot in shorts with no map, casually dragging his partner to the summit. I couldn’t help remarking to him that I hope he kept warm in the wind, and while he looked sheepish I doubt he’d make a different decision next time. The zigzag path back down is easy to navigate once on it, although once at the ‘halfway loch’ (Lochan Meall an t-Suidhe) we headed off on the path northwards to more bog trotting as we headed back to the track to the North Face car park. Having hiked in Asturias a few times before I was prepared for open trails and amazing views. The Camino Real del Puerto de la Mesa, high up in the mountains provides all this, along with an amazing insight into local history. The GR-101 is a path that runs from south to north through Asturias, leaving Torrestío and ending at Las Cruces, after passing through Belmonte. The route follows the old Roman road of La Mesa, more commonly known as El Camín Real. This route linked the Castilian plateau with the town of Gijón. The Roman road is around 45km long. This trail also has a variant, the GR-101.1 Camino Real de Cueiru to Villanueva, which is what we walked (in reverse). For an Open Street Map view of the whole of the GR101.1 click here – we opted to walk as far as the old historical town of Bandujo / Banduxu. We started our walk along the trail from Castanedo del Monte, a small village in the hills above the old industrial town of Trubia and heading for the medieval town of Bandujo. From Castanedo del Monte the trail, signposted as the GR 101.1, heads out of the village on a small lane which hugs the side of the hill and looks out over the woodland and valley below. The lane eventually turns into a dirt track and heads into the woodland towards the old local mines. The town of Trubia in the valley used to be a bustling industrial town with workers coming up the hill to work in the mines. Now the mines are abandoned and provide an interesting feature along the walk. From the mines the path winds up the hillside to eventually reach the top and the village of Linares, where you can follow the road to reach a small car park where people come to sit and admire the view. Here the Camino Real del Puerto de la Mesa, is at its peak. The track now heads across the top of the hill, giving amazing views to the mountains beyond as it winds along. On a scorching hot day at the end of August it was beautiful, but also a shade free place to be at midday. We continued along the track as it wound around the hillside, past farm fields and small limestone escarpments above. Despite being a walking trail this is also farming country, with lots of cattle roaming, and the occasional farm truck whizzing past kicking up the dust. Around lunchtime we reached Cuevallagar, a plateau with a perfect lunch spot near a tree. After a feast of Asturias cheese and bread with cider we followed the GR101.1 towards Maraviu, turning off the track to head across the grassy plateau. Eventually the track re-emerges for a while and you start to wind downhill to a bend where you reach a junction and turn right to end up in another grassy field. Here you head across and uphill to reach a gate and the road. We were met at the gate by an old farmer tending his cattle and a small yapping chihuahua. He offered his chilled CocaCola from a hidden freezer box, which Leah of course accepted in her fluent Spanish. He confirmed that we were on the road which headed down to Bandujo. While the route was no longer the official trail and now a tarmac road it was still quiet and peaceful and on arriving near Bandujo I could see why Leah had insisted that this was our goal. The church of St. Mary in the centre of Bandujo is of medieval origin and underwent restoration in the 18th century. The palace of Bandujo and its tower is one of the best preserved late medieval defensive towers in Asturias. This building also served as a prison and town hall. Here we were lucky enough to be met by Dan, Leah’s husband for a lift back to Villanueva. Crossing the 1 foot wide ridge of snow I was very aware of the snow melting under my feet and becoming unstable. I held my breath and walked confidently, eyes ahead. 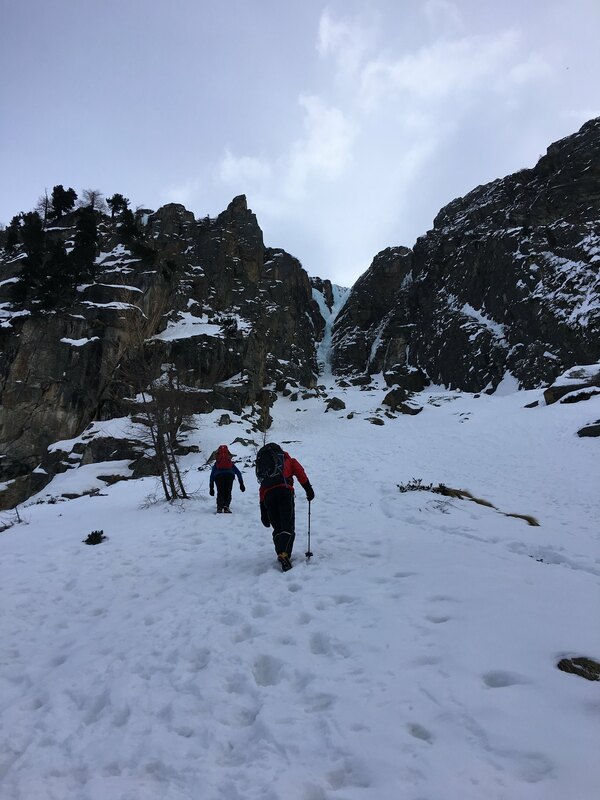 We’d already lost half an hour on the ascent waiting for a team ahead of us to climb the snow to the ridge line, their guide leading the way and belaying them up. 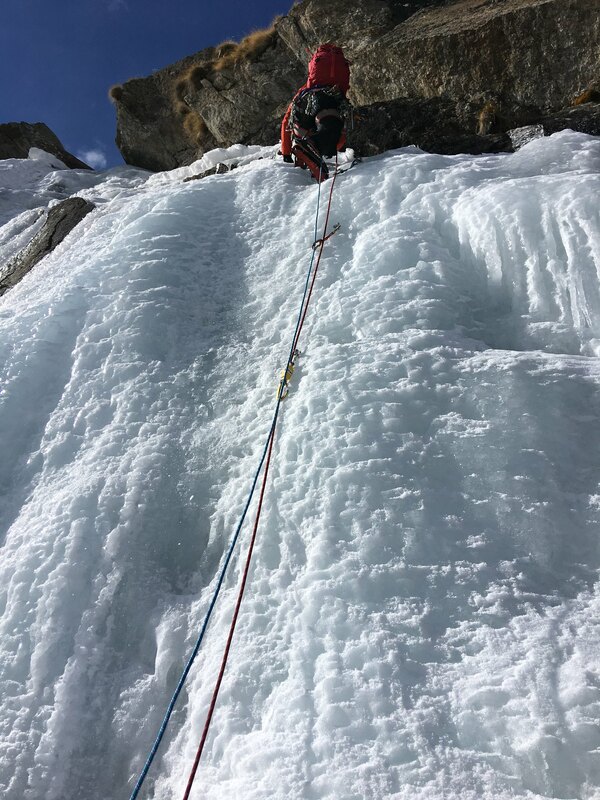 When we crossed the ridge we had to wait again for the guide to cross the couloir, digging a foot deep through the snow to place ice screws, securing the traverse to the metal stake and beyond to the rocks. Waiting on a route is never ideal, especially when the snow under our feet was fresh and only had one night of freezing. And the sun was already high in the sky, melting it. Our decision to have a go at the Jungfrau was borne out of our original goal to climb it and the Monch on our trip to Switzerland, and out of frustration at having our plans change due to wet weather for a few days. For 4 days it rained heavily on and off, a few of those times we had been caught out trail running or crag climbing, determined to make the most of the breaks between showers. The weather had promised to be glorious on Saturday, the day before we went home, so after a long discussion about the likelihood of the snow higher up having had chance to consolidate, we gambled on a trip up high to try the Jungfrau. We also winced at the cost of the Jungfraujoch train, at £180 or so each this wasn’t a cheap gamble. So Friday afternoon we headed up on the train, through the low cloud and drizzle. There’s no doubting that the Jungfraujoch is an amazing feat of engineering, but in the mist we were unable to really appreciate this, with no view to be had at the Eismeer station half way up the inside of the Eiger. Despite the awful weather the summit station was busy with tourists, also unable to appreciate the landscape their were in from the panorama windows of the cafe. We kitted up at the doorway and headed out along the snowy track to the Monchjoch hut, it what can best be described as typical Scottish conditions. Damp and foggy. Waking at 3am to discover that it had been clear skies overnight and the ground had frozen was a great relief but we were aware that this wasn’t likely to last and the unconsolidated snow while frozen now would soon melt in the morning sun. We were the second team out of the hut as we headed back along the track to the Jungfraujoch where we roped up and headed across the glacier as quick as we could to the bottom of the Rottersattel ridge. The views down the glacier even at 4.30am were beautiful. Before stepping on to the rock ridge we had to cross a crevasse bridge, I wondered how stable it would be as we descended later. The rock ridge began with what we now realised was typical Swiss broken rock before we reached the bigger stable rocks. Climbing the ridge we moved quickly together, traversing round the east side and heading left before climbing up to the top. Once up the rock we had a lovely snow plod across the broad ridge to the bottom of the ascent. The sun was already shining and we’d caught up the guided group ahead of us. We had a snack and a drink waiting for the group to ascend and traverse the snow ridge, mindful that we were losing valuable time and the snow was melting. 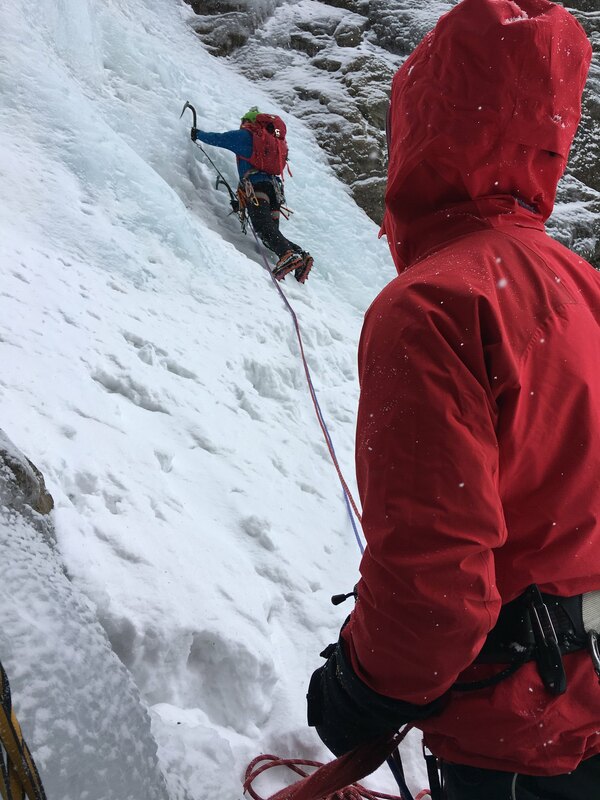 We were grateful to the guide for breaking trail, but his choice to belay his group one by one up the snow was taking time. I was particularly nervous when we traversed the narrow arete and onto the snow bank which looked down on the steep western side. The metal stakes were appreciated on the traverse. From here we had a rocky ridge to ascend to the summit, but with the sun beating down and the snow turning to slush beneath our feet, within 100m of the summit at 9am we decided to turn around. The route we had come up had required considerable front pointing to ascend. With quick discussion and much disappointment, we decided to turn around in order to descend safely – to reach the summit might have taken an hour to get up and back to where we were and it was a chance we didn’t want to take. Retreating from a route is always disappointing. The team ahead summited and thanks to their guide who knew an alternative way to descend they did so quickly. However, without this knowledge we saw the giant serrac as an impenetrable obstacle to descend, and so we had to retreat the way we came, down the mushy snow, carefully. 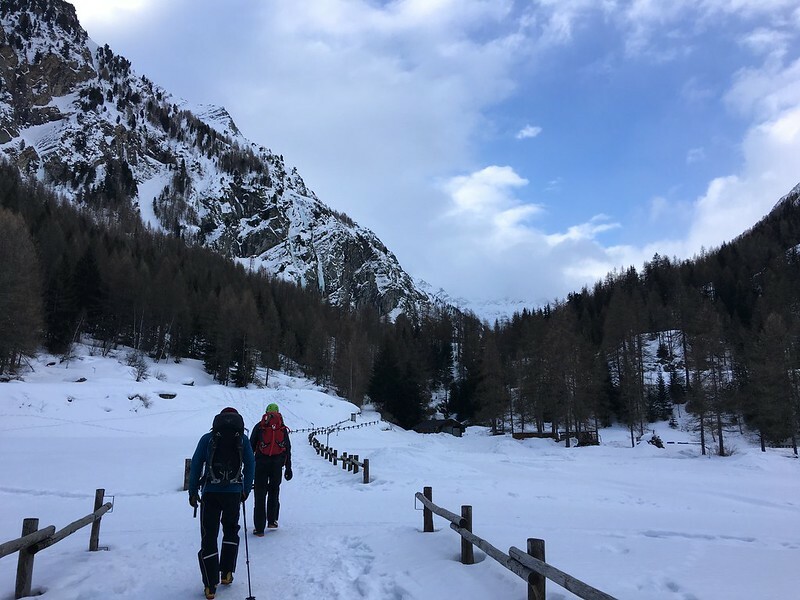 As we reached the bottom of the rocky Rottersattel ridge we realised that the crevasse bridge was now too soft to walk on and to walk above it on the slope too risky to try – the snow too soft to hold an arrest if one of us slipped. So we had to head down the other side of the ridge and descend much further on shale to reach the glacier. The trek back to the Jungfraujoch station was incredible slow and tiring in the midday sunshine. Towering over Grindelwald town the Wetterhorn is captivating, its ridges and high glacier catch the eye. Its also less likely to be shroud in cloud than the Eiger so looks seriously impressive. The route up the Wetterhorn from Grindelwald takes in the Wilsgratli ridge up to the Wettersattel and then snow or rock to the summit. It’s not immediately obvious from the town as it is a narrow ridge in the centre of the Crinnen glacier. Knowing the ridge was AD- there was a long discussion about its complexity, and whether I was going to be able to haul myself up it without too much whinging. In hindsight, we should have also had a discussion about coming back down. The route starts at a large car park near the Wetterhorn hotel and follows a track through the woodland which then heads steeply northeast to pick up a path which contours around the side of the mountain. The walk in to the Gleckstein hut was also only 3 and half hours which was quite attractive after the slog we had to get to the Mutthorn hut a few days earlier. It was lovely, a pleasant meander around the mountain heading slowly uphill and around towards the Oberer Grindelwald glacier to reach the hut. The Gleckstein hut is popular with guides for teaching alpine skills and for hikers walking into see the glaciers, and you can see why. When we arrived we sat looking out across the valley watching the sunset. We left the hut at 4am, the first out, but this left us route finding to find the Willsgrati ridge to reach the Wettersattel. While there is an obvious path which runs up to the Chrinnen glacier, there are also a number of paths which branch off from it. 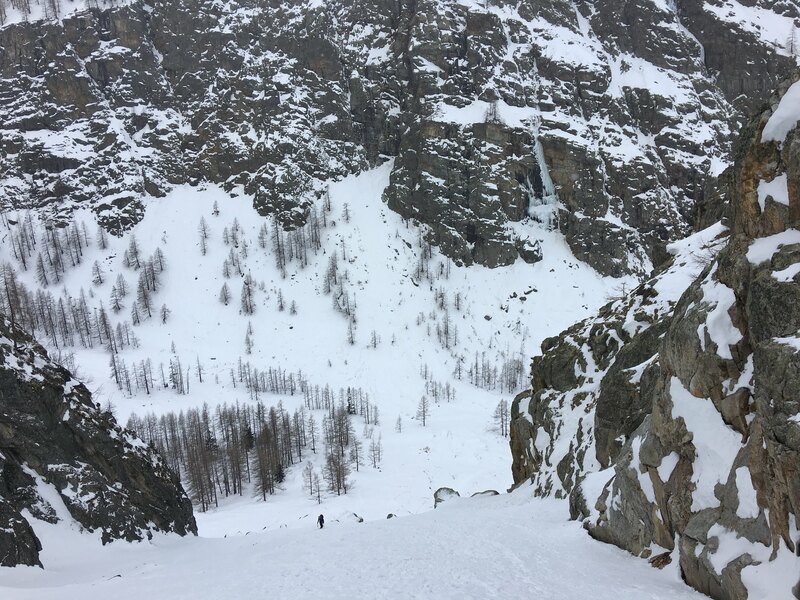 Once on the glacier we roped up and headed uphill to find the snow gully which provides access to the route, described in the guide book as ‘climb up unpleasantly for 200m’ before crossing a couloir before getting to the Willsgratli ridge. Once off the glacier it became clear that the rock on the Wetterhorn is not at all stable, even when frozen. We crossed the couloir to head onto the ridge where we stuck to the ridge top to ascent. Once on the ridge it was mostly scrambling to reach the Wettersattel col. Roped up we weren’t quick, but then I knew I would find this tricky, given the exposure and loose rock. Despite some whinging from me, we kept to guidebook time to reach the col and onto the snow. The snow was the quickest way to reach the summit so we headed up to a glorious view. We were also lucky to get a selfie with the Eiger!! The sun was already hot and melting the snow as we descended from the Wetterhorn. We decided to use the stakes on the rock, which in hindsight was slow albeit safer than the snow. We were the last of the three groups that has ascended that morning to get back on to the ridge and descend. As the ridge is well known for rock fall this meant that we weren’t going to have anything fall on us, but we had to be safe to prevent dropping rock on others. Despite the AD- grade not being the hardest alpine route I’ve done, the descent back to the hut was definitely the scariest I’ve completed. Teetering on the rock and trying to place gear to protect ourselves I can admit I was scared for the full 6 hours or so it took us to get back down from the summit to the hut. This was made much worse when a couple who were being guided were airlifted from the ridge in front of us. The helicopter came close to the ridge and picked up someone before heading down to the Gleckstein hut. Later we passed a blood splattered rock. Back at the hut I asked how they were and was pleased to find out the female had slipped and suffered only a leg injury, but this hadn’t stopped us from imagining the worst as we had descended – being aware that they had been climbing without helmets. The lower part of the ridge is tricky to find the exit route, once you’ve passed the three stakes look for a way off to the right. If you’re lucky you might find the stakes across the couloir to get back to the more solid rock and eventually the glacier. We were slow, possibly dehydrated and hungry when we finally got off the glacier and down to the hut where we had lunch and fluid before descending back to the Wetterhorn hotel. It was a long 18 hour day! 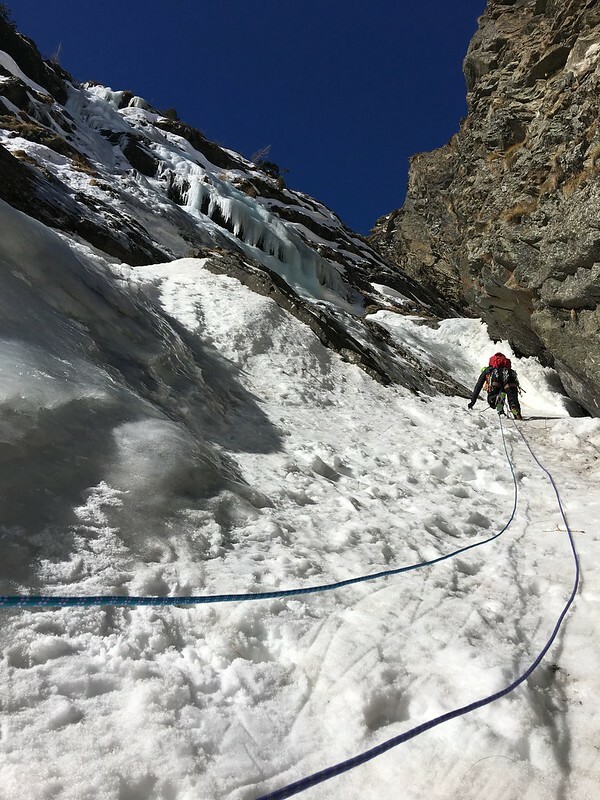 Acclimatizing well is at the core of a successful mountaineering trip to the Alps. So starting low and working our way up the altitudes was a sensible approach to our plans in Switzerland. It’s easy to do when you’re somewhere like Chamonix where you can reach high altitudes with relative ease on the cable cars, but the Bernese Oberland proved to be a different beast entirely. We chose the Tschingelhorn due to it being a low alpine summit at 3562m and having a straightforward summit route, graded PD (French for a little difficult) so we knew it was achievable. Having to walk in also meant that we would be able to acclimatize as we went. What we hadn’t banked on was a mammoth walk to reach the Mutthorn hut at the base of the Mutthorn ridge, almost in the middle of the glacier, and 2000m of ascent from the start at Stechelberg. It didn’t look that far on the map, but when you add in the ascent to get there, and the hot sunshine, it was a hard slog. Starting at the end of the Lauterbrunnen valley in the tiny village of Stechelberg, we parked up and followed the signs to Obersteinberg, a 6km walk gaining around 800m height. Whilst an endless slog uphill on narrow woodland tracks, the path provides a fantastic opportunity to see the changes in the landscape and walk through a pristine UNESCO Word Heritage landscape. Much of the Jungfrau region achieves this designation but as we found out later in our trip, this also brings bus loads of tourists so the solitude we found on our walk into the Mutthorn hut can’t be easily found elsewhere. It took about 3 hours walking through the woodland forest trails and up to the pastures to reach Obersteinberg, where a hut provided a refreshment stop and a chance to check the map before heading across the glacier beyond. From here we followed signs to Oberhoresee, a little glacial lake and a popular destination for hikers exploring the valley. We stopped briefly in the baking sun and contemplated cooling off there on our descent. From there the path becomes less distinct as it turns from a walkers path marked by red and white striped marks, to an alpinist track marked by blue and white marks. It winds through the moraine, scree and eventually out on to the glacier itself. From looking at our map it became clear that while it was still very early in the season and lots of fresh snow was still around, the glacier itself had receded considerably from what was marked on the map. This also meant that a direct approach wasn’t possible due to the crevasses and seracs now present. So we had to loop around to be able to ascend up the glacier towards the hut. The snow conditions weren’t great either as the glacier was covered in a foot of snow which had melted to create a surface like the moon. The Mutthorn hut perches on the end of the Mutthorn, a shaly rock ridge which rises out of the glacier. To reach the hut required circling around the crevasse to access the door. Despite its isolated location, or perhaps because of it, the Mutthorn guardians provide a very warm welcome – a hot drink and chocolate to all of their guests. Run by the Swiss Alpine Club, members get a good discount, as do reciprocal clubs. The evening meal was basic – soup followed by cheese, potatoes and salad and then fruit salad – but considering our location I was surprised to get anything fresh. We left the hut at 4am to ensure we had enough time before the sun rose and started to melt the snow. Crossing the moon like glacier was much easier when it was frozen from a night under clear skies. The view from the summit was fantastic, looking over to the Breithorn and further beyond to the Aletschhorn. Had we properly considered how challenging it would be to get to the Mutthorn hut we would have budgeted for staying more nights and doing other peaks in the area, but as we hadn’t we descended back to the hut and after a quick lunch continued back down to the valley – a very long 17 hour day mountaineering. Its taken me a while to write up my Easter trip, so much so that trad climbing season is well underway. Anyway…. here you go. There’s some routes in Scotland that are epic and have a reputation for endurance, requiring nerves of steel or providing amazing views. The Ring of Steall doesn’t disappoint on any of these. The Ring of Steall is a classic Scottish route, covering 4 munro summits and narrow rocky aretes, made even more special in full winter conditions. The route is around 10 miles long with over 1800m of ascent, making this a tough walk in any conditions. 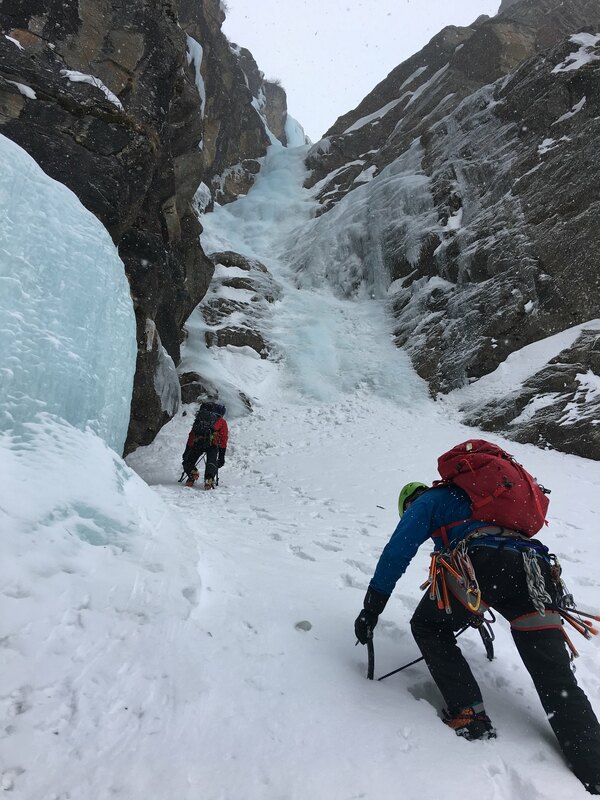 We tackled this route over Easter when winter was still dominating the mountain summits in Scotland, but snow and ice can lie on Scottish mountains well into the Spring so make sure you check the conditions before you set out and be suitably prepared. Heading from Glen Nevis lower falls carpark, the walk up the first munro, Sgurr a Mhaim is a long tedious trudge of endless ascent. We didn’t reach the snow line until around 800m but once there the cloud lifted and we were treated to an amazing view of the Devils Ridge. I was a bit apprehensive as we crossed the Devil’s Ridge. 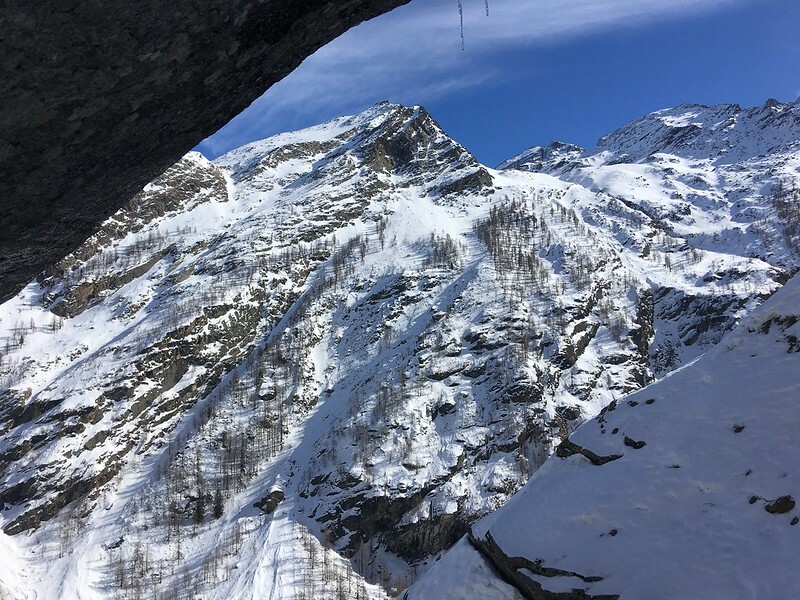 Its incredibly narrow in places with a few spots of tricky scrambling which can test your head for heights, especially scrambling in crampons. This is grade I terrain in winter so don’t under estimate it; even in summer it would be a tricky scramble. Despite a few narrow places the Devil’s ridge wasn’t the intimidating crossing I had anticipated and we reached the other side in no time. From the end of the Devil’s Ridge we circled round towards Am Bodach, crossing over the summit of Sgurr am Lhubair. I knew what to expect on Am Bodach, having climbed the summit from the other side in December. 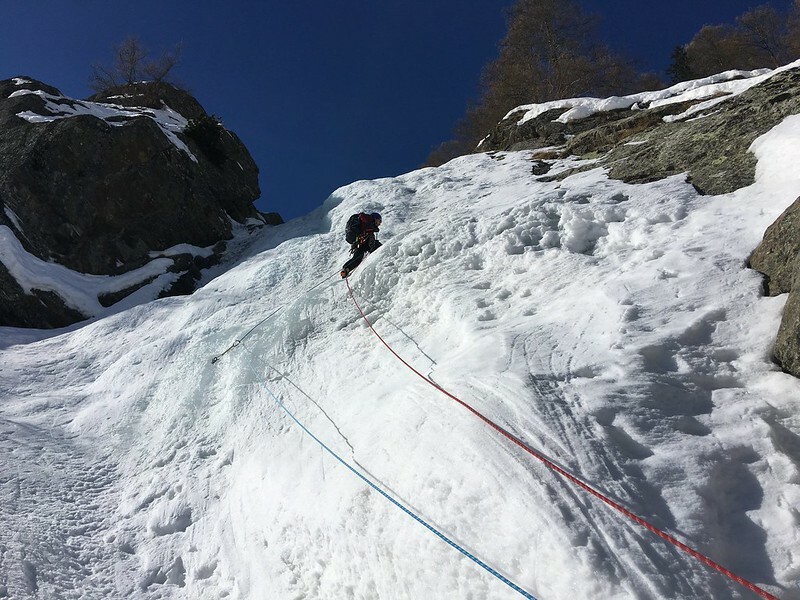 However, much later in the season the deep powder snow had been through a winter of freeze and thaw cycles and the descent down to the north col was 200m of concrete-hard neve ice. For the first time on the route I was genuinely a bit scared. I’d slipped on old neve about 8 years ago, the fall resulted in twisting my knee, so I took front pointing the descent slowly and counting under my breathe to calm myself. Thankfully once we’d descended the snow softened and we even dug out a bucket seat in the deep snow as we crossed to Stob Coire a Chairn, to have lunch in the sunshine. This munro summit is easy to cross without consideration after Am Bodach, but does provide a good view back along the route. From the third munro we descended more hard neve, though not terrifying, to our final munro. The scramble up on to An Gearanach summit isn’t difficult, but towards the end of the day it did require effort to pick through the snow and rocks to the top. Once across the summit the descent also required careful route finding to pick our way down through the rocks and crags. It took several false starts before we found a route down to the col from where we could head East to descend to the river. Don’t head West to the Steall waterfall, whilst this looks like an easier descent initially, you cannot descend directly from Steall Falls. In winter conditions we had to front point down the steep snow banking to reach the river. From there we continued to descend the path to Glen Nevis and the boggy crossing to reach Steall hut and the steel rope bridge. I’ve just walked off the hill from another disappointing weekend of 70mph winds and a lack of activity it’s made me think – I’ve had difficult winter. I started with the intent to bag lots of winter days towards my winter ML log book and it started well, with a trip with to Glencoe with a friend also working towards her winter ML. (She passed this week). Almost right away it went downhill. I felt demoralised as I wasn’t as confident as her and lacked belief in myself. I compared myself to her, seeing that I couldn’t keep up with her and she was much quicker at making navigational decisions. Since then I’ve had 4 other trips to Scotland which have only established this feeling of not being good enough. I’ve been left to do my own thing by my climbing friends in the Cairngorms and not having the opportunity and confidence to join them, and then two big days in Braemar which I was definitely on it with the navigation but lacked confidence in leading. And then I went to the Ben, and didn’t manage to finish the CMD Arête circular, only making it to Carn Mor Dearg summit due to really strong winds. I feel like I’ve had lots of failures and not just that one. There was failing to try Dorsal Arête out of fear and failing to try the Devil’s Ridge on a windy day. So at the end of winter with one trip north left I’m thinking of not bothering and giving up and letting the spring seep in. I can navigate really well. I know this. But I worry about being in whiteouts. I have all the skills but on steep terrain I still freak out, especially climbing rocky ridges in the ice. 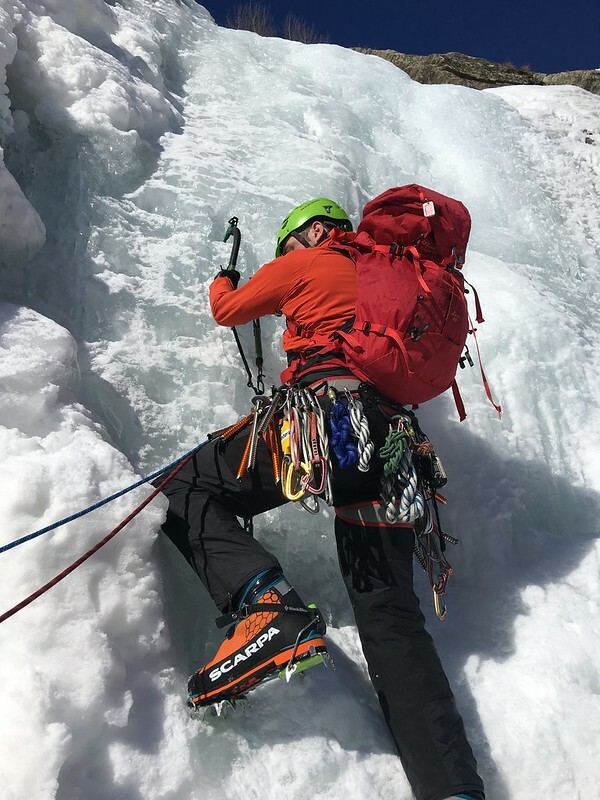 I’ve suffered from spending the winter with climbers who are technically more skilled than me and have generally left me behind for doing their own adventures. You think this would work in my favour as I’d get to solo some peaks, but I’ve always had someone in tow who either wasn’t as skilled and lacked enthusiasm for effort or occasionally a climber who wished they were climbing and were demoralised they were walking instead. In honesty, I’ve had some good days too. Snowshoeing in Glen Feshie was the highlight of the winter, gorgeous weather and conditions and I felt success being on my own in the clag in the summit. 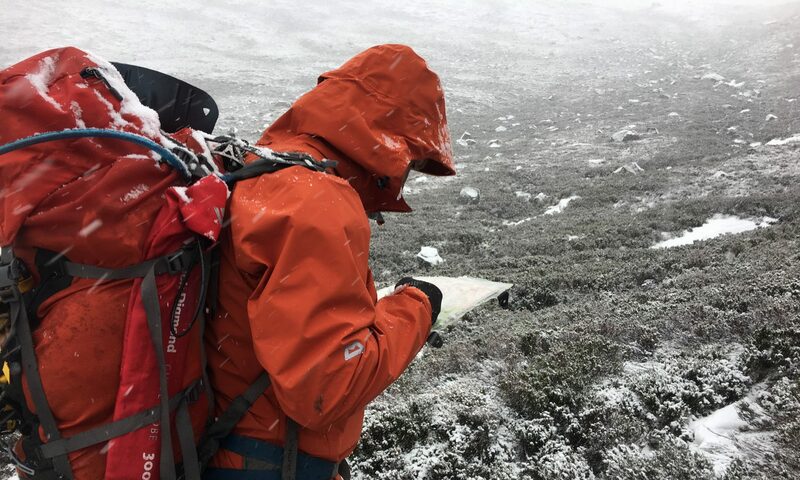 I did enjoy the navigational challenges around Braemar too, gaining confidence in my abilities to navigate in poor visibility. But on the whole winter doesn’t feel like a success to me. There’s been more disappointment. How do you learn to winter climb? I joined a mountaineering club to get out more in winter and while that’s happened, after three winters with them I’ve not yet climbed any winter routes. Winter is so short and the conditions in Scotland so unreliable that climbers in winter lack the patient to teach others in the same way that you find at the summer crag. How do you learnt to climb in winter without paying for an instructor? 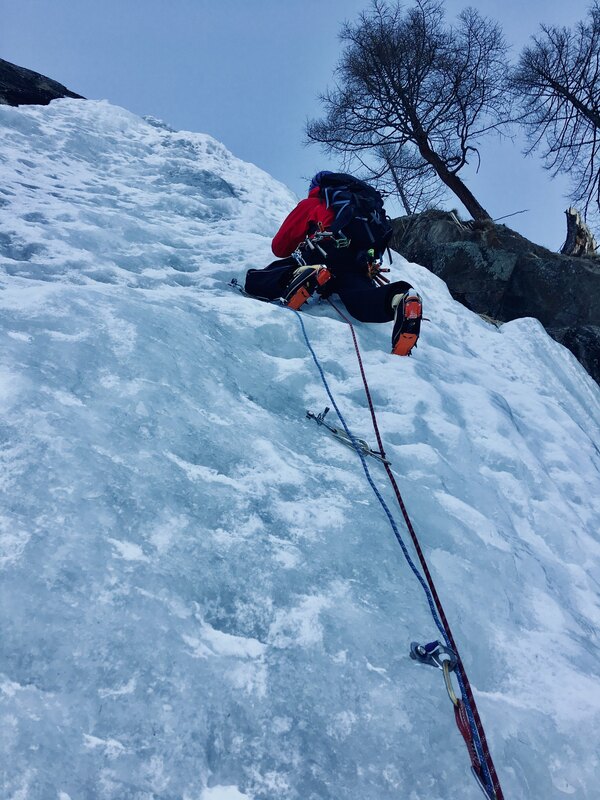 I had a great club trip to Rjukan in 2017 which was aimed at giving people the chance to learn as well as progress. That’s the only time I’ve ever had that opportunity to try and learn. 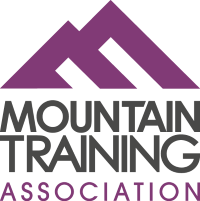 I’m not against paying for instruction but with winter climbing how does that really build skills to get outside again without a support system? Or is it my learning style? Maybe I struggle to learn from the people around me because I lack the confidence to just have a go. I met a guy this winter at the CIC hut who was in his first winter season climbing and had already lead a IV pitch. His attitude was to just get on something and try, to learn quick and have a go. Maybe my cautious attitude is what holds me back. Maybe my fears and my reluctance to push myself and find myself scared somewhere exposed, is what stops me just getting on and seconding behind an experience leader. I had hoped to climb a few routes this winter with friends and the only opportunity I had on Dorsal Arête I bottled it. Since then there’s not been any opportunities, so I’ve failed in that objective for the season. I’d also hoped to have more log book days completed, but I’ve done 12 this winter. It feels like poor progress. I’m heading into spring being grateful for the chance to whinge on the rocks with the more friendly and helpful trad climbing community. I’m trying to be less critically reflective of myself and be more open to opportunities. I’ll try this summer to not let fear prevent me getting on routes so that perhaps next winter I’ll get to try something. I might still squeeze in one last trip this winter to Scotland but as for the future of my winter ML? I think I need to be honest that I don’t know if it’s really for me. I don’t know if I’m really a leader in the winter environment, maybe I bit off more than I can chew with that particular challenge. We had checked out the popular and only easy to access climbing spot of the Cascade de Lilliaz at the start of the week. It looked like a good plan for when we would be too tired to do more long walk ins and when the weather was predicted to be less reliable. The cascades is the only climb which isn’t a committing route as you can bail off at any point along the river route. This also means it is very popular with climbers and spectators. We had only intended to do one day of climbing there but after Moliene wasn’t in condition we headed back there on both Friday and Saturday. There had been heavy snowfall and any thin ice had been covered enough for us to momentarily forget about it. So on Friday we headed up and climbed pitch 3 on the right side. The ice was actually quite good although it did have gaping holes in some places where you could see straight through to the waterfall below. We went continued up the river gorge to climb pitch 4. Pitch 4 felt much easier and while there was a mid way belay point we did it in one pitch. We had such great fun we headed back down to do the left side of pitch 3. The following day we couldn’t bear to pay for ski hire so we headed back to climb the first two pitches. Having arrived a bit late we discovered the truth about the Cascade de Lilliaz, it is a very popular ice crag. Especially for groups and for instructors to take clients. As such it took us a while to be able to climb up the middle of the waterfall. I found this line incredibly tricky as the centre of the waterfall was cauliflower ice formations and very snowy and soft on the top. I didn’t feel stable at all so there was some severe whinging from me. From here we walked around the gorge to pitch 2 which was much more fun. Standing on mushy snow with my axes hooked around a thin lip of ice, I got that horribly familiar sensation in the pit of my stomach when I really don’t like where I am stood. And I had to traverse off the mushy snow to get on to the ice. Having had a fantastic time climbing on Il Sentiero dei Troll a couple of days earlier, we headed back to the Valnontey valley to climb the waterfall next to it, Valmiana another WI3. My initial reaction was that the first pitch looked massive and steep, but I tried not to let that put me off. As it was the first pitch was steep and felt quite hard for a WI3, but it was stepped out from previously climbers so didn’t feel that tricky. The second pitch was a nice snow plod with an ice pitch in the middle, by which time we were already in the sunshine. The third pitch was also straight forward too. It was the fourth pitch, when we were already about 120m up the waterfall that I met my match, the mushy snow and horrible traverse. 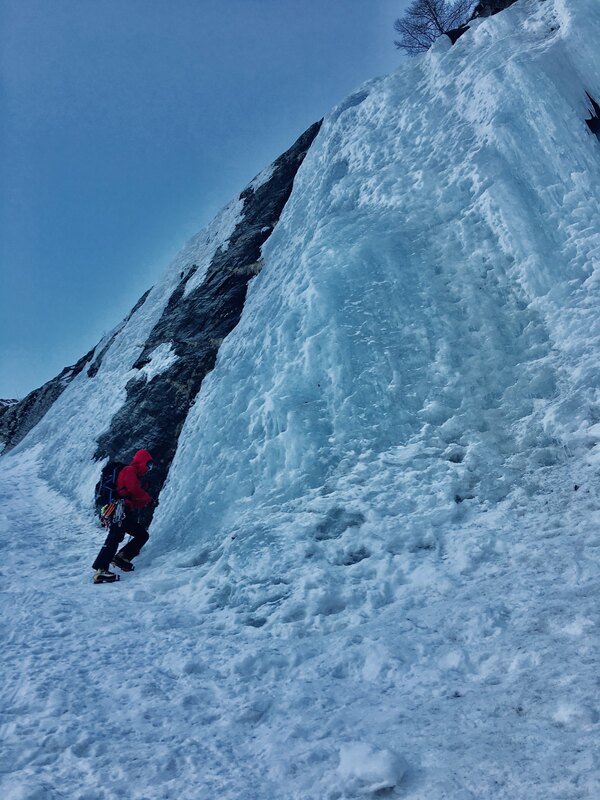 Just as the hard, not stepped out ice ended the mushy snow began, with a traverse aiming for the gap in the rocks. I didn’t really enjoy trying to kick out warm wet snow to get across to solid ice, so when I emerged out of the top of the pitch I wasn’t very happy. Thankfully the final pitch was a long steep snow pitch, (in the shade so not mushy!) and a solid bit of ice, which was hard on the calves at least felt more secure. After 3 days climbing we had got into the rhythm of climbing but I was also starting to ache all over. Despite the huge walk in to Flash Estivo, right at the end of the Valnontey valley we opted to try the WI3 route. So on the first over cast day of the week we headed for an hour and a half walk down the valley to the bottom of Flash Estivo. 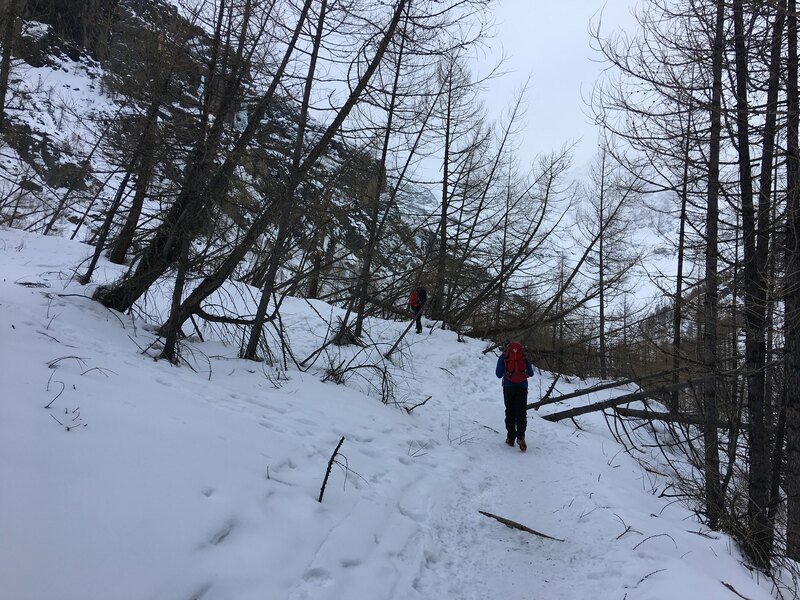 The first issue was that it was starting to snow and we were heading up a 500m 45 degree snow slope to get to the bottom of the route. This wasn’t exactly the quickest route to get to. As we walked down the valley you could see the aftermath of earlier avalanches. As we started the route the snow set in for the day. 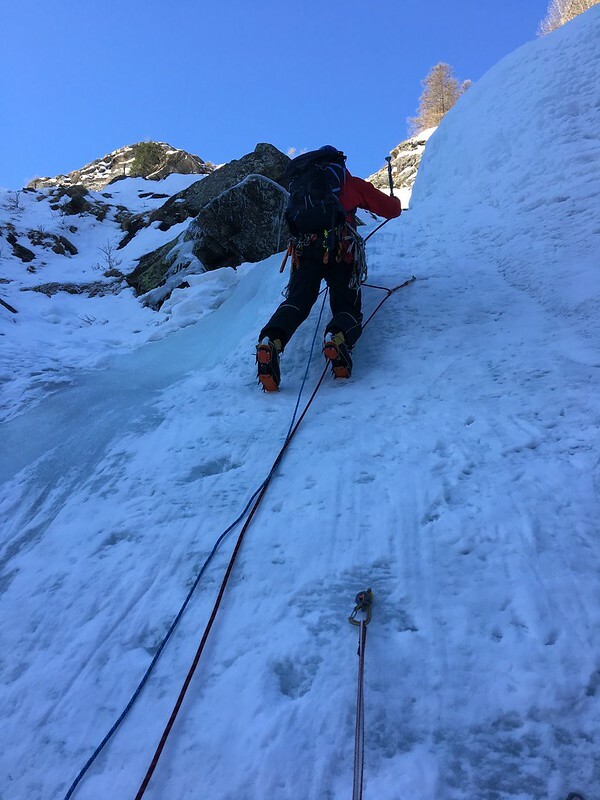 As we set off up the second pitch it became apparent that the ice was either solid or totally unstable so after much effort in trying to find a good route up it we eventually bailed off. Whilst we were all a bit disappointed it was the right decision given how long it was taking to get up the route and the weather conditions. Turning back on a route is never a bad decision. Others might have battled on, but given the remoteness of our route and the deteriorating weather it was the right decision. By the time we had abseiled back down and walked out it was dark and snowing heavily. 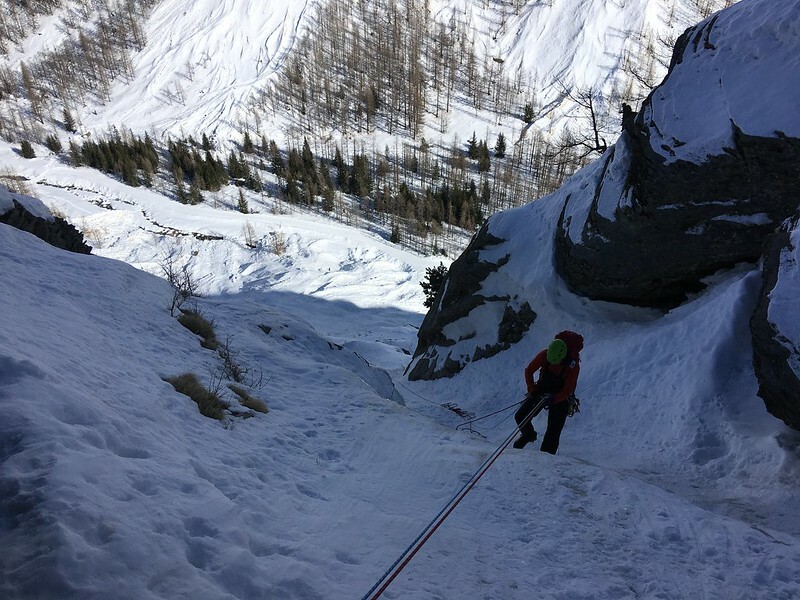 Ice Climbing in Cogne – Multipitches galore! 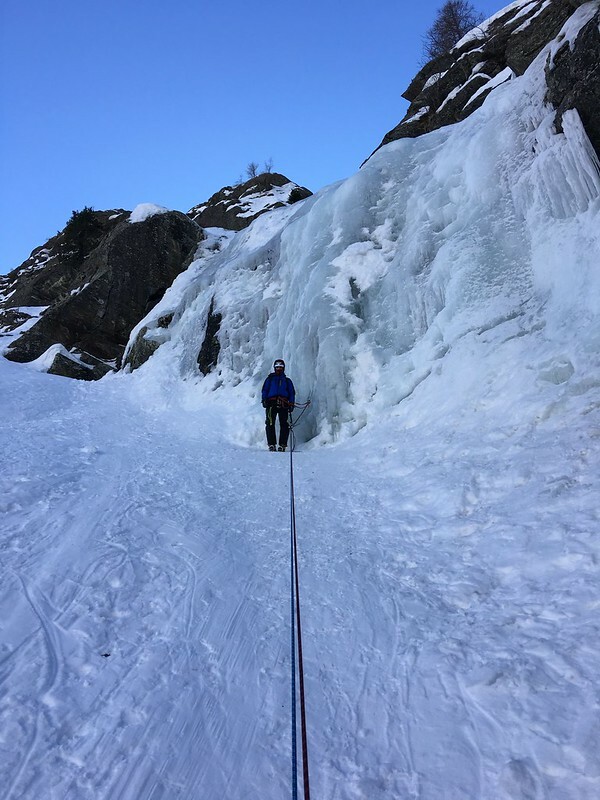 Having had an amazing time in Rjukan ice climbing last year I was very excited about our trip to Cogne this year, but very aware that it wasn’t going to be easy peasy climbing. 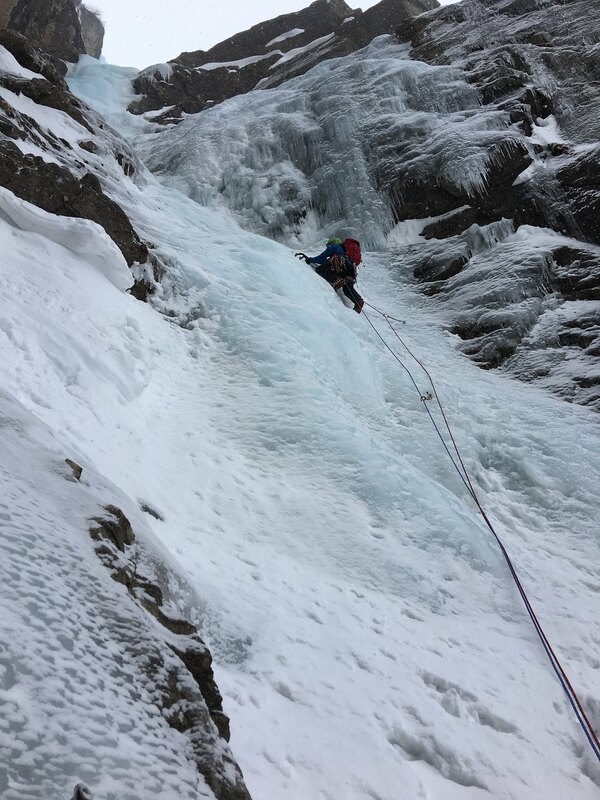 Rjukan is the ice equivalent of climbing at Stanage, something for every ability, lots of single pitch ice making it nice and short and 5 minutes from the car. Yes there’s multipitch routes and hard stuff to scare the pants off you, but there’s options for not doing these routes and still having a great time. Cogne is the opposite in everyway. 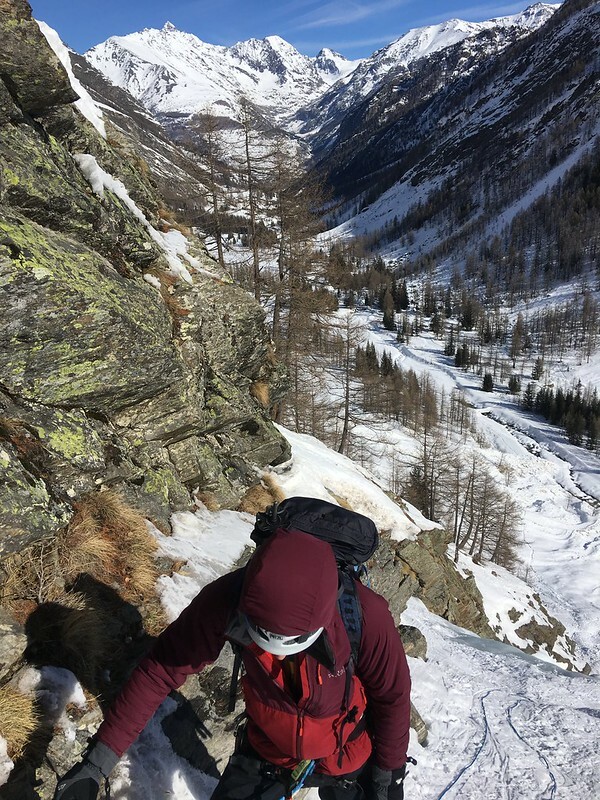 In the heart of the Alps, Cogne has two main areas for climbing, the Valeille valley and the Valnontey valley – with climbs being on both sides of the valley from the sides of the mountains. The routes form in mountain gullies or from the edge of crags with terrifying chandeliers to huge walls of solid ice. 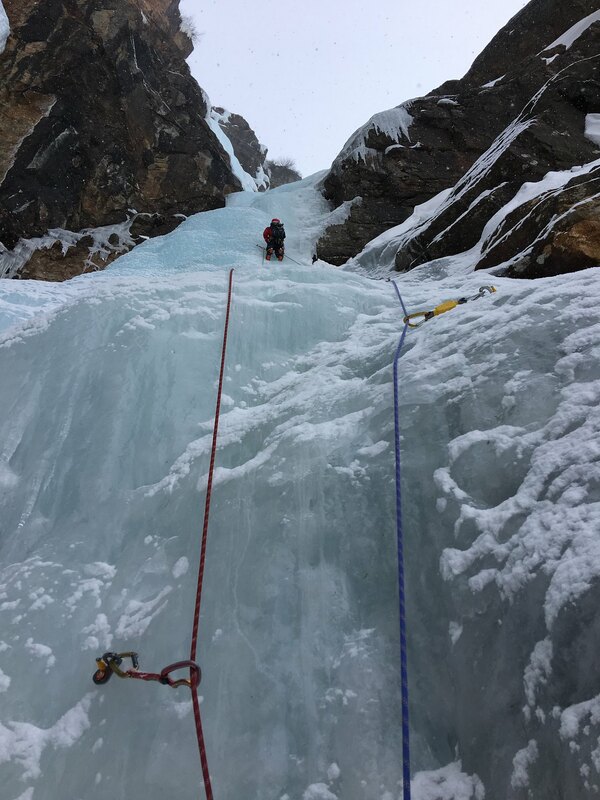 All of the routes are committing multi-pitch ice which require abseiling to get off. 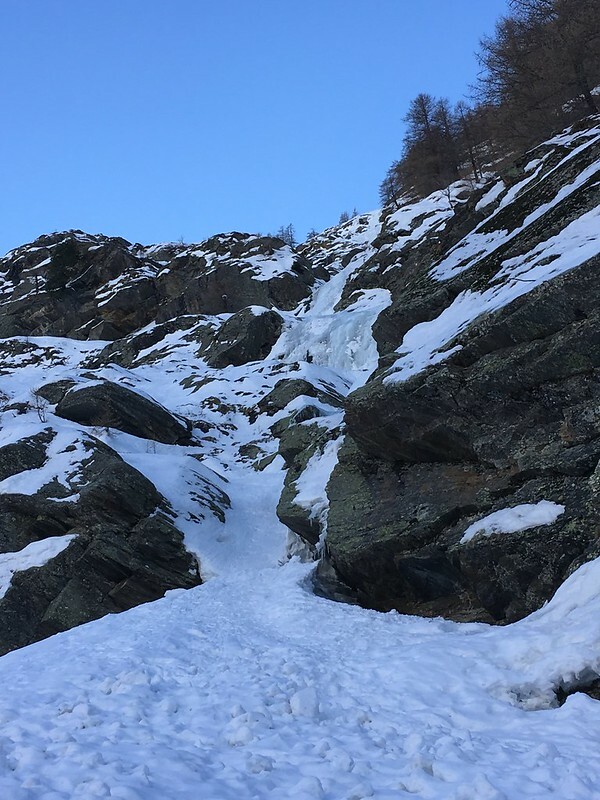 This isn’t a place to come for your first ice climbing or multipitch climbing trip. There isn’t a great selection of guidebooks in English for this area either. 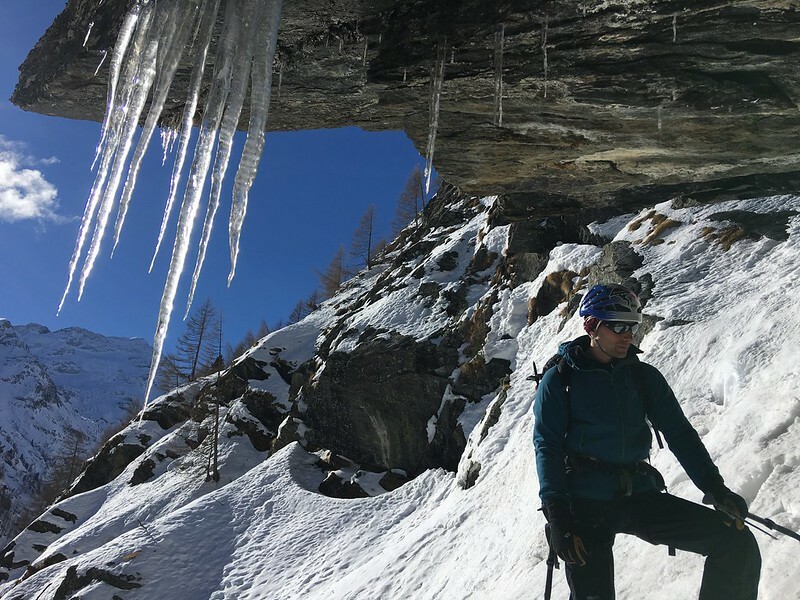 The new Alpine Ice guide by Mario Sertori is the only one and while it does cover routes in Cogne its isn’t a complete guide and only provide highlights of the popular routes. There’s plenty of French and Italian guidebooks, if you can translate them! Bar Licone – the climbers bar in town but also THE place for climbers to share route information online. Many of the routes have handy topos created by climbers, so worth a look to check distance between belays and where the difficult sections are on routes. 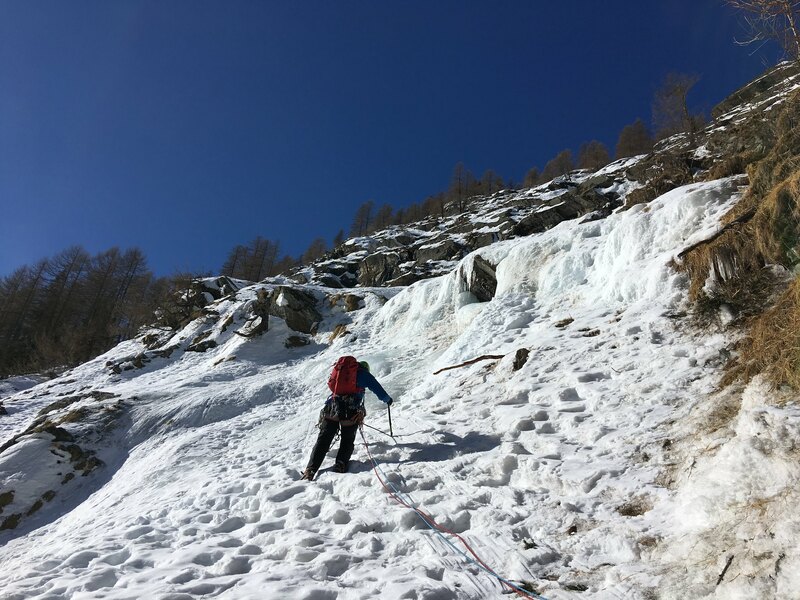 Despite the challenges of finding information on the routes, ice climbing in Cogne is a dream for those with experience. There’s nothing better than the delightful warmth in the midday sunshine, which is something that you definitely don’t get climbing in Norway! We had opted for our first route to be a WI3 in the Valnontey valley called Il Sentiero dei Troll. Il Sentiero dei Troll provided a good initiation to ice in Cogne and set the tone for the week. If you want to get out and climb ice you need to be out of bed early (out of the door before 8am) and be prepared to climb all day. We did the route in 4 pitches of 60 metres with two of these being at bolted belays. The joy of Europe is that many of the routes are at least partially bolted, when you can find them under all the ice! That said make sure you know how to do Abalakov threads as you will still need to do these for some belays. It was freezing when we left the car park at Valnontey for the walk in and on getting out of the car we quickly put on extra layers. Close to the end of the valley it wasn’t too far to walk in but did give us change to check out some of the other routes. With the warm temperature the week before we noticed some of the routes at the end of the valley weren’t quite formed. 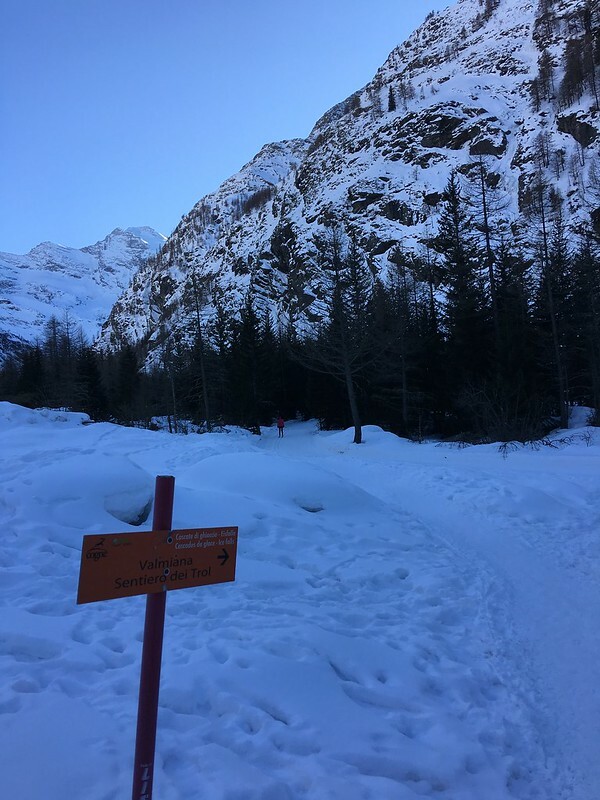 While Cogne is committing ice climbing, it is still pretty accessible with most of the routes being fairly well sign posted at the bottom of the valley (though a guide book is needed to know which is which) and the walk in was on a clear track adjacent to cross country skiing runs. Ascending the steep snow slope to the bottom of the ice was the first task, reminding me that the best place to put on crampons and a helmet is long before you actually need them. 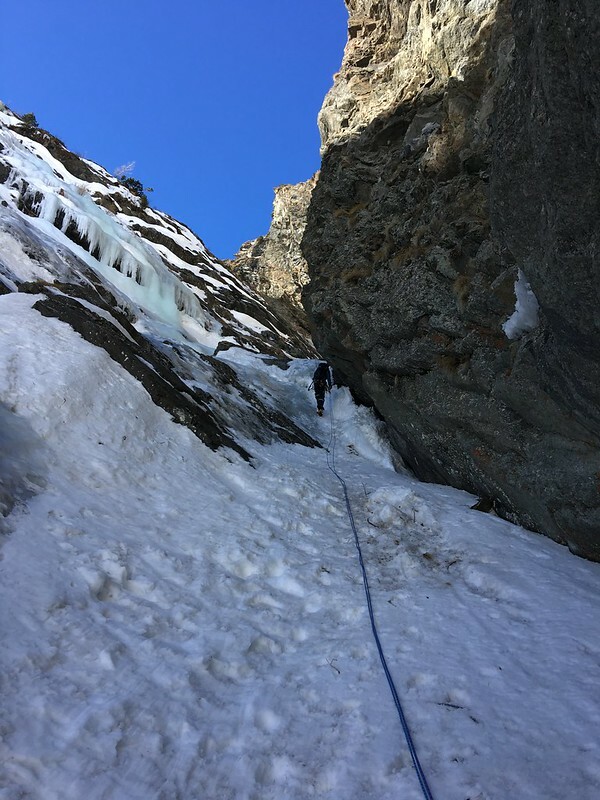 The route was a mix of steep ice pitches and graded snow slopes and by pitch 2 we were climbing in the sunshine and had taken off quite a few layers of clothing. The climbing was fantastic and when we reached the top of pitch 4 we decided we’d enjoyed the best of the route and so abseiled back down. At which point I stopped to take this photo of Jared next to the ice on pitch 3, did I really climb that?! I have to start by saying Fenilliaz isn’t a rubbish route. Had I been in Scotland I’d have been super happy spending the day in a snow covered gully. Having flow to Cogne though to get my axes into some ice I was a bit disappointed by the lack of ice on this route. Fenilliaz in the Valeille Valley starts by ascending another long snow slope (a recurring theme in Cogne). We started the actual climb from a good belay spot under a huge boulder. From here the route takes a long steep snow slope to a short ice pitch, before another snow slope. Unfortunately that was where the fun ended and the route seemed to pitter out. Disappointed, and with not enough time left for another route we opted for a short day and a chance to check out the popular Cascade de Lillaz.